What is the dark secret beneath Newcastle's Black Gate? 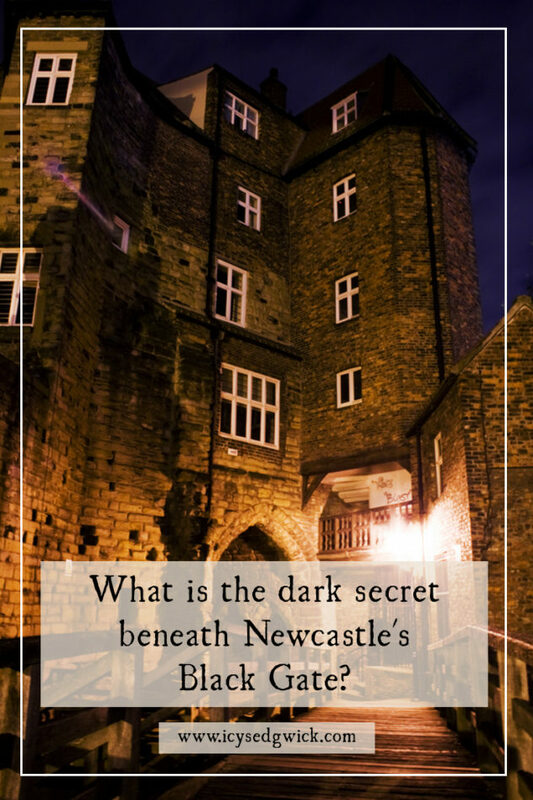 What is the dark secret beneath Newcastle’s Black Gate? Walk south along St Nicholas’ Street in Newcastle and you’ll spot a medieval building on your left. Surrounded by the behemoth of Milburn House and the engineering of the railway arches, it seems out of place. But the Black Gate once stood as the entrance to the formidable Castle Keep. This 13th-century barbican repelled invaders intent on reaching the Castle. These days, the Gate is a picturesque spot in the heart of old Newcastle. But a darker secret from the city’s past hides below. Come with me and we’ll explore that secret together. What is the Black Gate? Newcastle built its Castle in 1167. Building work on the Black Gate started in 1247. This defensive gateway served as the Castle’s North Gate. The signs of a portcullis remain. So does the ghost of a Cavalier who fell foul of the iron gate, according to local legends. Arrow slits in the walls give glimpses of the guard rooms beyond. But the building of the wider town wall made the Black Gate redundant. By the reign of Elizabeth I, the building was a “roofless wreck”. Locals used the defensive ditch as a rubbish dump. One of King James I’s courtiers leased the building in 1618. Alexander Stevenson added the second and third floors to increase the available living space. In 1636, John Pickell remodeled part of the building. He even turned a guard room on the ground floor into a tavern. And in the 17th century, Patrick Black leased the building. There’s no concrete evidence that he ever lived there, but his name lives on. Interestingly, some people believe it got the name ‘Black Gate’ for a darker reason. One legend tells that the drawbridge might be pulled up while people were still on it. The ‘black’ referred to their blood. Another piece of Newcastle folklore refers to someone getting on the business end of the portcullis. In 1730, part of the eastern side of Stevenson’s additions actually collapsed. Repairs used bricks, the building material of the day. You can still see the change of material if you stand on the walkway behind the Gate and look up. 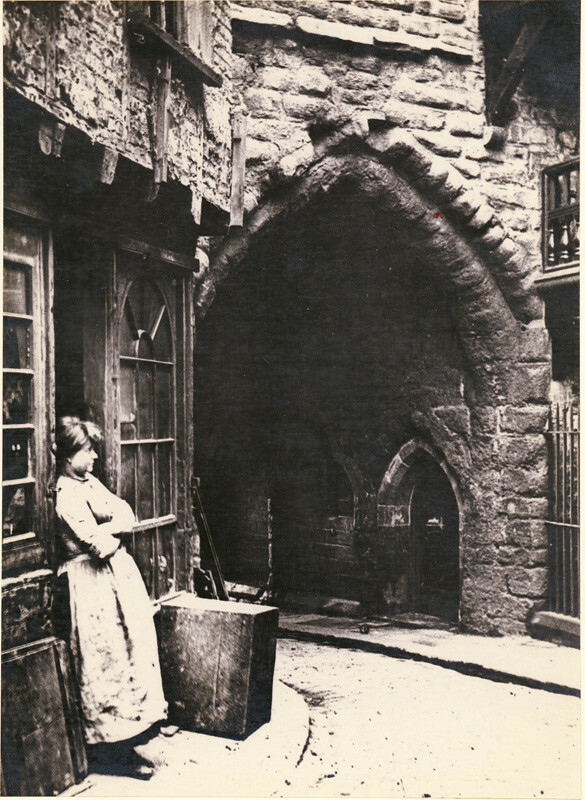 By the 19th century, the whole Castle Garth area had become a slum. The authorities planned to sweep it away during the construction of the nearby High Level Bridge. Another proposal to demolish it appeared in 1856. 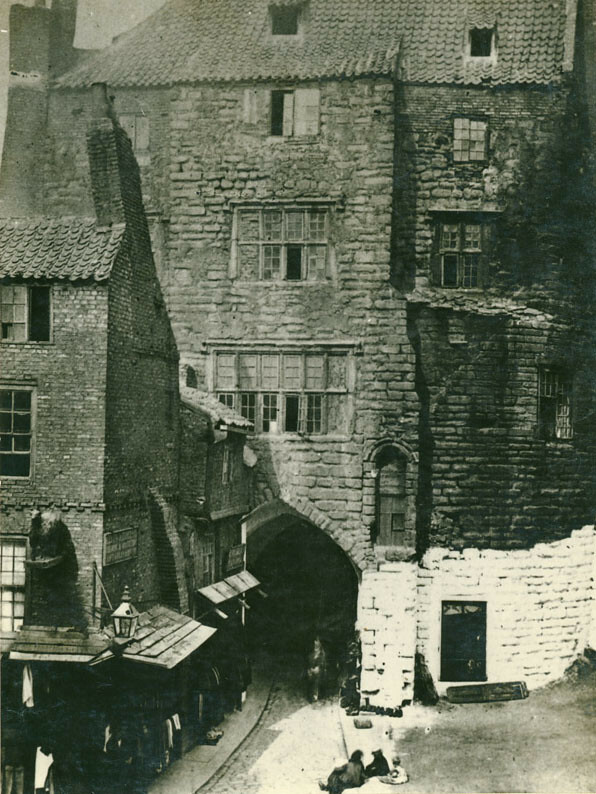 The Newcastle Courant described the Black Gate as a “dilapidated and apparently uninteresting pile” prior to its restoration . Thankfully the Society of Antiquaries rescued the building in 1883. They turned it into a museum to house their growing collection. This museum closed in 1959, and it became a bagpipe museum. But the Society still used it as late as 2009, mostly as a library. Until 2014, the Black Gate largely stood empty and unused. Paranormal entertainment companies used it for ghost hunts. I often led teams on some of these ghost hunts, and results varied. Most activity centered on the pit outside – but more on that later. Heritage Lottery Funding helped the Old Newcastle Project to restore the Black Gate. It reopened as a museum and education space. Now hosting the visitor centre, the Black Gate is once more the gateway to Old Newcastle. The Black Gate now hosts fascinating talks on a range of subjects. Two of my favourites explored the history of the Vampire Rabbit and the links between Bram Stoker and the North East. The gorgeous library shelves from the Society still remain in the Black Gate. They now form part of the display in the new museum dedicated to the Castle Garth. Shelves and cupboard hold exhibits and items salvaged from the area. But what about that dark secret? Beneath the Black Gate lies the infamous Heron Pit. It takes its name from Sheriff William Heron of Ford, Governor of the Castle of Newcastle from 1247 to 1257. Medieval chronicler Matthew Paris described Heron as “a most avaricious man, a hammer of cruelty to the poor, and a persecutor of the religious orders.” Heron acted as tax collector. Scholars estimate that 30% of the taxes he collected ended up in his own coffers. He installed the Heron Pit for a cost of £32. Some call it a dungeon, though it’s really an oubliette. With no doors or windows, a trap door in the roof was the only way in or out. You can still see the pit today, open to the air (and rubbish tossed in by passersby). In Heron’s day, only prisoners were thrown in here. The lack of light and ventilation must have made it truly hellish. According to the sheriff’s accounts, a house stood over it in 1356, nestled against the inner wall. Many believe the jailer occupied it. Imagine sitting in your own filth in absolute darkness. Is that your heartbeat you can hear? Or is it the footsteps of your captor far above you? A second prison, the Great Pit, lay beneath a square tower opposite. 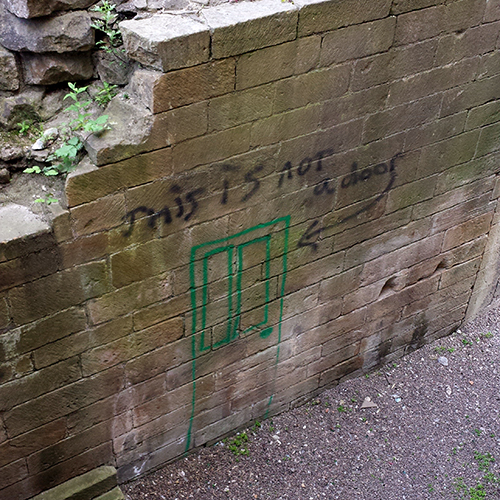 Much like the Heron Pit, a trap door was the only way in or out. In 2014, some wag with a can of spray paint decided to remedy that! The house over the Heron Pit and the tower over the Great Pit no longer exist. During the 19th century, houses and shops would have occupied the sites instead. Can you imagine living in a house and not realising what lay beneath your feet? In 1940, a black wooden shed hid any view of the Heron Pit. Paul Brown noted that “any visitor to the Black Gate who asks to see it may do so.”  Excavations in the 1970s unearthed the Pit. 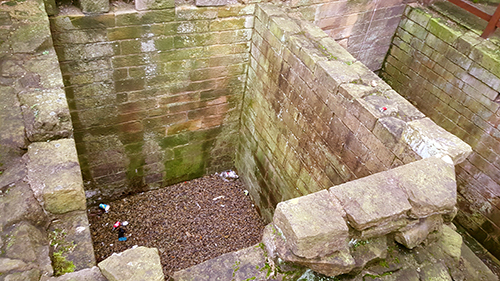 They also revealed the former defensive ditch beneath the drawbridge. A casual Google search unearths tales of paranormal activity in the area. It’s not for me to say what’s true and what isn’t. Would you like to see the Heron Pit for yourself? Pop along to the Black Gate in Newcastle upon Tyne! And throw in a visit to the museum and Castle Keep for good measure! Find out about opening times and prices here. Cool post! Love the photos. Living in NYC we think that a building from the 1700’s is ancient. Not so for the old world. Yeah, I sometimes forget how old the buildings around me actually are! What a fascinating post Icy, loved it. Definitely a place to see when I next go north! Haha I’m working on it! Very interesting stuff! I always pass by this area on my way back from visiting my sister, when I’m going to Newcastle station. I’d love to have seen it as a bagpipe museum!! Sorry can’t remember the bag pipes but the museum was very clean, bright airy place so I can see whey would refurbish and keep! Often wander what happened to the curator, Stuart, as I left Newcastle back on early 80’s never came back for more than a week at the most. Now living in Malaysia after many overseas work related positions! I lived in the Black Gate from about 1969-1974, and while I was there the original museum (which housed lots of strange old ‘northern’ things like mouse-traps and a reproduction old kitchen) was converted to be a rather less exciting bagpipe museum. We lived in the loft, and my bedroom was the room you with the big window from the front. I haven’t been back in there for the last 44 years, but now they’ve converted it into offices I’ll see if I can pop in next time I’m back in the UK and see if anything remains to remind me of my old home. Hi Jason, the Black Gate isn’t offices, it’s open to the public now. (Most of it, anyway! We do have some rooms on the top floor for staff only). 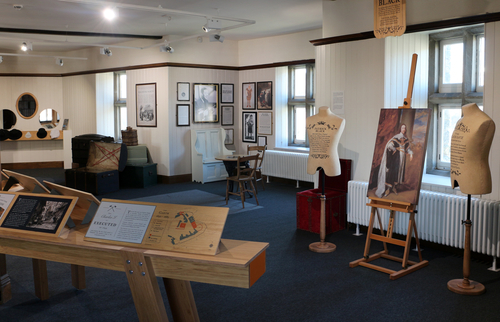 If you do ever come back to the UK and want to have a look around the museum room and the rest of the Gate, we’ll be happy to answer any questions for you!